This kinetic sand activity is definitely the most popular one in the eyes of my three year old. Together we made cupcakes, sang "Happy Birthday," and engaged in lots of adorable pretend play. 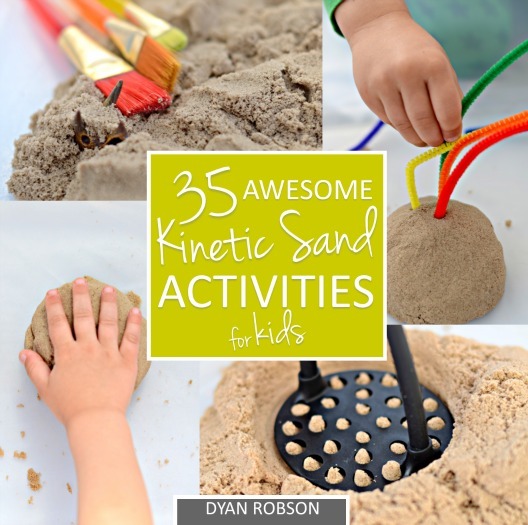 This activity only uses a couple of materials which you likely already have on hand. And like seriously, how cute is this photo of my son blowing out his birthday candle?! There is one thing my three year old really loves and that is cooking. For as long as I can remember, he has had an interest in cooking, whether it's for real or for pretend. 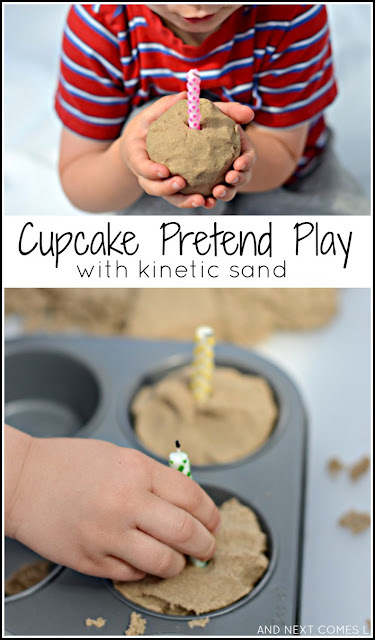 So one sunny day, I paired his love for cooking with some kinetic sand and together we made birthday cupcakes. Just fill up the muffin tin with kinetic sand and add candles. What a fun way to work on fine motor skills and engage in sensory play! You can even pop out the cupcakes and hold them in your hands, which was easily my son's favorite part. He would sing "Happy Birthday," blow out the candle, remove the candle, and pretend to eat the cupcake. He even let his stuffed kitty cat join in on the fun. He would sing to the cat or let the cat remove the candle. K also enjoyed filling up the muffin tin and pretended to put them in his pretend oven. He would ask me how long to cook it for, count, and then make a dinging noise for when they were done cooking. So much fun!